Blalock-Taussig shunt | Adventures of a Funky Heart! If you’ve checked out the ABOUT THE AUTHOR page in the blogroll, you’ll see that I construct my own action figures. I’m not that skilled – don’t imagine me actually pouring a mold, letting it cool, and then assembling the parts into a body. What I do is take an existing figure and through the use of new clothes and small alterations, I make that figure into a new action figure. 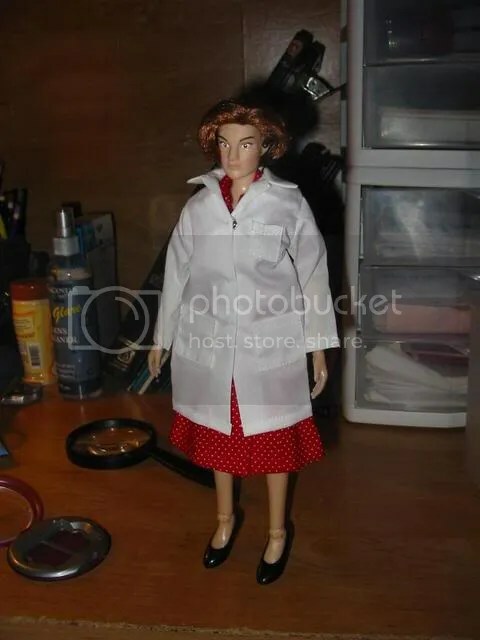 Here’s an 11 inch tall figure of Dr. Helen Taussig that I created for an Adult Congenital Heart Association silent auction in 2008. I invested about $40 in the base figure, clothes, and accessories; she sold for $100! I’d love to make another one, but I haven’t been able to find that base figure since. I think it has been discontinued. It may be for the best – there was only one Helen Taussig! 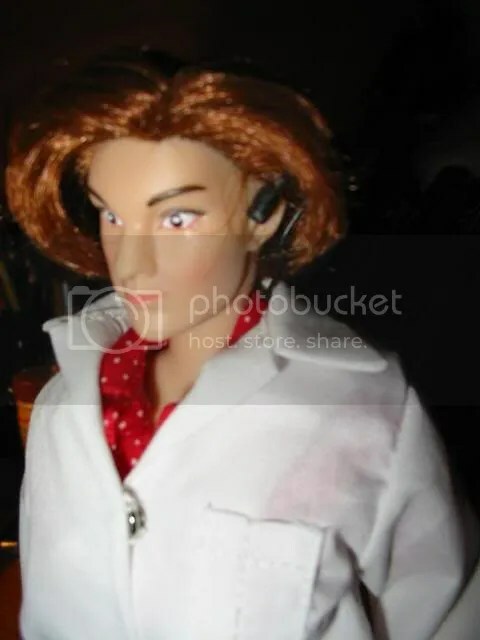 Answer: The Taussig doll has her hearing aid in the wrong ear. The figure’s hairstyle naturally exposes her left ear, which would make the hearing aid placement more visable. The real Dr. Taussig wore her hearing aid in her right ear. Here’s an interesting report from the March 2006 issue of Heart: A look at the outcomes of surgical correction for Hypoplastic Left Heart Syndrome, or HLHS. What makes this report so unusual is that it covers twelve years at the same hospital: While surgeons, doctors, and nurses come and go, the hospital policies and standards of care stay in place and hopefully improve. So this can be considered an unbiased study. When results from more than one facility is used, the results can be affected by a hospital that has more (or less) successful results than average. Beginning in 1992, 333 patients underwent the Stage I surgical correction for HLHS, also known as the Norwood procedure. 203 patients underwent the Stage II operation (the Bidirectional Glenn), and 81 had the Fontan Procedure (Stage III). While HLHS is difficult to overcome, the report does not elaborate on the difference in numbers. It is quite possible that patients had their Stage II or Stage III operations at different facilities. Over the course of the study, mortality after the Stage I operation dropped from 46% during the first year (1992) to just 16% in the last year (2004). The survival rate jumped dramatically in 2002, when the Stage I was altered: the Modified Blalock-Taussig Shunt that was part of the operation was replaced by a Right Ventricle to Pulmonary Artery Conduit. Medical research is a long, tedious assignment – there are very few “bolt of lightning” moments and it often requires gathering massive amounts of data. But it works, and is often the only way to learn if a new theory is both effective and safe. I walked through my door at 10:31 PM, Eastern time. The flight was delayed a bit by weather, but other than that it went well. Lucas is going to have his first surgery soon, so keep this young man in your thoughts. Keep his mom in your thoughts, also… she’s struggling with the eternal question, WHY? There’s no good answer to the “Why?” question yet. Perhaps if we find the answer, we can learn how to stop Congenital Heart Defects. But in reality the question is almost never “Why?” but rather an unasked question that every Heart Mom asks: Did I cause this? As far as we know, NO! My mom, for example (and millions of others like her) did everything right, yet I was born with a heart defect. No one had any clue how or why some hearts were defective back then, so my mom did the natural thing – she blamed herself. Lucas will undergo the Blalock-Taussig Shunt soon, and his parents will be frightened beyond their imagination. When the operation takes longer than expected (they always do) his mother will fret and pace and stare at the clock. She’ll meet the best doctors and nurses and wish she never had to know these people. She’ll learn as well as any soldier exactly what it means to go into battle. She’ll come to know her son’s heart as well as she knows the layout of her own home, and when something is wrong, she’ll probably be the first one to pick up on it. She’ll cringe every time the phone rings and he isn’t there. She’ll want to know where he is and who he is with all the time, possibly so much so that he thinks that she is stifling his social life. One day he’ll come to realize that she’s just looking out for him, but it will seem that that day will never come. But she’ll keep at it, never losing hope and never giving up. Why? Because she’s a Heart Mom. And Heart Moms go above and beyond. We had been at the University of Alabama at Birmingham (UAB) Hospital for only a few hours, just long enough to be admitted and assigned a room. A nurse and one of the Cardiac Surgical staff were asking us the “usual” admissions questions. “Do you happen to know what operation you had at Johns Hopkins?” we were asked. My eyebrows shot up. The operation that had saved my life was now in the trashbin of history. When you “take down” an operation, you basically undo it. There are times when you have to restore the heart to it’s original configuration (or as close as you can get it) before you attempt another correction. Because the Pulmonary Artery is cut, it’s pretty difficult to unhook it and reconnect it where it is supposed to be. The true irony of this story wouldn’t be revealed until a week later, when surgeon Dr. Albert Pacifico cut my Left Subclavian Artery and connected it to the intact branch of the Pulmonary Artery. That’s right – my second operation in 1977 was a repeat of the very first Congenital Heart Surgery: the Blalock-Taussig Shunt, first done in 1944! Don’t trust the Funky Heart! You can read anything on the Internet. Anyone with a computer and a little knowledge can post whatever they want. In fact, I hear that “Funky Heart” guy is really a 31 year old Supermodel living in one of the suites of the Toronto Skydome. She’s looking for a new home, because they renamed Skydome “Rogers Centre” and her former husband is named Rogers, and she can’t stand the guy. I read it on the Internet, so it must be true! One of the best resources on the internet is Google Alerts. Create an alert for anything you want – your name, for example – and Google Alerts will send you an e-mail anytime it detects what you are interested in. Now most of what I write about comes from my personal experience, but I have a group of Alerts set up for various terms related to Congenital Heart Defects. I may find something that you need to read, or an article could remind me to write a post that you might find interesting. They are very useful! In regard to congenital heart disease treatment, most of the times the disease is easily rectified through use of surgical procedures; in some instances in fact there isn’t even any need to get congenital heart disease treatment performed. In any case, whether or not a person gets congenital heart disease treatment they can still hope to live a better, fuller and healthier life. Most surgical procedures can effectively fix congenital heart disease problems though even after the procedure has been completed there is always need for ongoing medical care because there is the lurking danger that the patient might soon develop disorders of their heart rhythm or develops endocarditis as a result of the surgery. No, no, no… the Adult Congenital Heart Association (ACHA) exists to try to improve lifelong medical care for adults with a Heart Defect, but according to this writer, there’s no reason for the ACHA to exist. After all, most heart defects can be fixed, and all you have to watch out for is events that would occur “soon” after surgery.There wasn’t a comment form on this webpage and no way to contact the author, so I couldn’t give him/her a piece of my mind. I will state this as simply as I can: If you are a parent and you follow this advice, your child will die. It is that simple: A Congenital Heart Defect is a complex, difficult health issue that requires lifelong medical care. There are no simple answers and no quick fixes. Even the more easily corrected defects (such as an ASD) require monitoring. So here’s what you need to do… Don’t trust me. Assume, if you want, that I am just an idiot with a keyboard and an Internet connection. Get the medical books. Learn everything you can about your (or your child’s) Heart Defect. Sit down with the doctors, and when he starts to slip into Medical Speak, ask him to explain it on your level. Go only to sources that you trust. Learn, learn, learn, and Keep Learning. Things change fast in Cardiology – someone born on the day of the first Blalock-Taussig Shunt isn’t old enough to retire yet. And until the 1980’s Hypoplastic Left Heart Syndrome (HLHS) was 100% fatal. Reagan was President when they had the first successes there… and that wasn’t that long ago. And remember that what you read on the Internet ain’t always so! What are you doing out here? Doctor Taussig is beside herself, wondering where you are! Please get in there and get scrubbed up, or she’ll have my hide! No I don’t know where Mr. Thomas is. Find him? Send him down to the OR? I don’t know about this… Yes, sir, you’re the doctor and I’m just an orderly. I’ll find Mr. Thomas myself! But right now, you need to be in the Scrub Room! It is November 29, 1944, and YOU are Dr. Alfred Blalock. Eileen Saxon has just been brought into Room 706 for heart surgery… the first such operation ever attempted. If you think you are up to the challenge, CLICK THIS LINK. WARNING: You may find this post to be somewhat disturbing. I stumbled across it quite unintentionally, looking for something else. Have you ever heard of the Aristotle Complexity Score? Since 1999, Congenital Heart Procedures have been assigned a score based on how complex the operation is. To calculate the Basic Score, you assign points to three different factors, then add those factors together. Since the low number on each scale as a 1 and the high is a 5, the Basic Score is a range between 3.0 and 15.0. The reason for the Aristotle system is not to claim “bragging rights” over other surgeons (and I certainly hope it is not used for that!) but rather to improve patient care. If the Operating Room calls the Cardiac Critical Care Unit and tells them that a patient is coming down who just had surgery, and the Aristotle Score is a 10, then CCCU knows to keep their eyes open. This patient just had a major operation and they are very ill. And just by quoting that one number, every Cardiac caregiver down the line will know exactly how fragile their patient’s health is. The first factor used in the Basic Score is mortality. Based on previous research, this takes into account the chances that the patient will die during the operation or shortly afterward. 1 point is given for an expected mortality of less than 1%, while 20% or greater earns a maximum of 5 points. The next factor is morbidity. A simple definition for morbidity is “a diseased state or symptom.” The Aristotle system bases the morbidity score on the lengh of time spent in the ICU. Less than 24 hours is one point, longer than 2 weeks is five points. The third factor is the perceived difficulty of the operation. No heart surgery is simple, of course, but fixing an ASD is less complicated than completing a Bi-directional Glenn Shunt. So an operation of the least perceived complexity is again worth one point, and the most difficult is worth five points. There are other factors that can influence the Basic Score higher or lower – patient’s age, gender, overall health, etc. – but just looking at the Basic Scores can be informative…. and scary! The “simplest” operation is an ASD repair, rated 3.0. My Classic Glenn Shunt (a “unidirectional cavopulmonary anastomosis”) is rated a 7.0. The Modified Blalock-Taussig Shunt (using an artificial conduit) is a 6.3, while a Blalock-Taussig done with a rerouted artery is a 6.8. The Norwood Procedure (Which is actually three separate operations, but considered one corrective procedure) is the 2nd most complex operation with a 14.5 rating. The only thing more difficult is an HLHS Biventricular Repair, which rates the highest possible Basic Score, 15.0. We all know Heart Surgery is serious, and knowledge of the Aristotle System only gives us a glimpse of just how serious it is. A surgeon is literally walking into a minefield, and how many of us would consent to an operation (for ourselves or our child) if we knew the true amount of skill that is required? You can’t just be good and be a Congenital Heart Surgeon… you need to be among the best! So after yesterday’s review, we have a good idea how a healthy heart works. But you or your child has a heart defect… what do we do? There are thirty five different, distinct Heart Defects. And if that isn’t bad enough, some of us have a “blend” – a defect that has traits or two (or more!) single defects. That’s why I’m going to recommend a book to you. Before I do, I’ll state this: I don’t work for this company, nor do I have any type of commission deal with them. What I do have is a copy of their book, and I use it a LOT. The name of this book is the Illustrated Field Guide to Congenital Heart Disease and Repair. There are two versions. Both have a spiral binding, so it can lie flat on a desk. The large format version is 7 inches by 10.5 inches, about the side of a larger paperback book. The pocket sized version is 4 inches by 7.5 inches, small enough to slip into a purse or even tuck into your pants at the small of your back comfortably. Even in the smaller size, the print is very readable. The book features an explanation and a diagram of all the identified heart defects. If that isn’t enough, most of the recognized Congenital Heart Operations are described and diagrammed, along with the major variations. For example, you can find descriptions of the Blalock-Taussig Shunt, the Mustard repair (which is rarely used today), two versions of the Fontan, and five different ways to complete the Norwoord Procedure. And if that isn’t enough, there is also a section concerning Cardiac ICU units, Electrophysiology, and information on some of the drugs that are available for Congenital Heart patients. This is probably the most useful book I have ever seen. I have the Second Edition, but I recently ordered the Revised 2nd Edition, which has been expanded to over 400 pages! The only thing that I don’t like about the book is that it has a few more “doctor words” than a newcomer to CHD’s may understand. Usually if you don’t understand the words, the diagrams will show you. You can buy one using this form. Don’t let the form scare you – this company sells the majority of its items to doctors offices and hospitals, that’s why you see the words “Purchase Order” and fairly high prices. The Field Guides cost $50 for the smaller version and $125 for the larger edition, and they can be worth every penny. What good is a deaf cardiologist? I’ve written about Vivien Thomas and Alfred Blaock; so it is time to write a few lines about the third person involved in the Blalock-Taussig Shunt: Pediatric Cardiologist Helen Brooke Taussig. For those of you who may not know, Taussig’s my personal hero. When I was a patient at Johns Hopkins in 1967, Taussig herself examined me. From what my parents tell me, she was officially retired, but still lived in the Baltimore area and “stopped by the office” occasionally. I was five months old at the time, so I don’t remember it. Her father was Frank Taussig, a prominent economist who taught at Harvard. Imagine his frustration when his daughter tried her best in school but still seemed to just not get it. I think every parent has shared that frustration at one time or another. It wasn’t her fault – it turns out that Helen Taussig had Dyslexia. Finally after a lot of patient work with her father everything just “clicked” and she was able to graduate. She went to the University of California at Berkley and then applied to Harvard Medical School. The problem was, Harvard didn’t accept women into its medical program, so Helen tried Johns Hopkins Medical School instead. After she graduated, she took the job as head of the Cardiac Clinic at Hopkins’ children’s hospital, the Harriet Lane Home for Invalid Children. Ironically, after becoming a doctor, Helen Taussig began to lose her hearing. And what good is a doctor – especially a cardiologist – who loses their hearing? Known mainly for her work in Pediatric Cardiology, few remember that Helen Taussig also played a critical role in averting the Thalidomide crisis in the United States. While Frances Kelsey receives credit (deservedly so) for not authorizing the drug for sale here, Taussig got involved when one of her German students commented that there had been a marked increase in the occurrence of Phocomelia in her home country. Taussig began to study the problem, and before long had determined that the morning sickness drug Thalidomide was causing birth defects. Because of Kelsey’s and Taussig’s actions, only 17 American children were affected by the drug. So, what good is a deaf cardiologist? It all depends on who that deaf cardiologist is!